The FDS 35 is the new industrial freeze drum skinning machine from Trio. 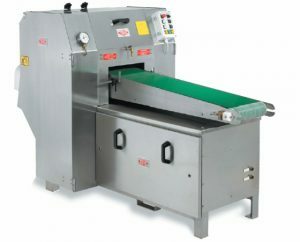 The new Trio FDS 35 Industrial skinning machine will increase yield by 2-5% compared to older Trio skinning machines. This translates to significant increases in income from the same amount of raw material. The new design is more hygienic and makes the FDS 35 skinning machine easier and safer to operate and service. It is designed on a solid steel frame made from 18/8 stainless steel. All parts that come into contact with the fish are made from stainless steel and plastic. The new knife section ensures longer life for the bandknife and has a built in sharpening device. The machine has an integrated cooling system, but can also be supplied for connection to a main freezing plant, either based on Freon or Ammonia. Conveyor length and design can be adapted to you particular process and can be fitted for easy switching between skin-on and skin-off production. The machine operates on the principle that the skin of the fillet freezes to the cold, rotating drum, and is thus held in position. (The freezing is approx. 1/10mm deep.) A rotating bandknife cuts the fillet away from the skin, and the skin is then scraped off the drum. The thickness of the cut, and thus the depth of the skinning is infinitely adjustable between 0-12mm. 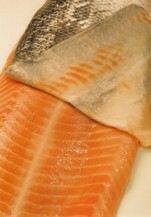 Fillets are sliced away from the skin without putting any strain on the fish meat or skin.